Kathy Quilts! > Cloth leaders from KathyQuilts.com are the strips of fabric that attach your quilt to your frame. If your quilt isn't straight then it will not turn out the way it should. The Grace Company quilting frames have the Fabri-Fast System to attach the cloth leaders to the quilting frame rails. The reason why quilting frames need cloth leaders is that there is an offset in the frame rails that would require you to add extra fabric to each quilt top so you could quilt all the way to the end of the quilt. It is less wasteful to add a cloth leader to the frame rail to compensate for the rail offset. 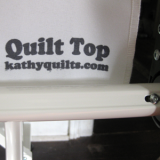 KathyQuilts.com makes leaders which are ready to install when you get them. We make a casing in both the long edges of each leader. 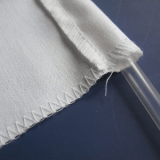 This makes it so one edge will attach to the frame rail with the Fabri-Fast tubing and the other edge has a double thickness of fabric so you quilt top or back stays where you pin it. You don't need a bunch of fancy markings or printing on your leaders that really serve no purpose. All you need is to know which rail you are pinning your quilt on at any given time. KathyQuilts.com stamps each leader so you know which rail you are working with. This is a huge help when you are new to quilting. Other than than knowing which frame rail you are working with, all you need to know is where the center of your leader is because you always line up the center of your quilt up with the center of your leader. Keeping things simple and functional really helps you to learn how to use your quilting frame the way it was designed. There is so much confusion that is created by companies that don't quilt but think they know all about quilting. Kathy is a professional quilter so she knows what will help you and what just wastes your money. We give you value for every dollar you spend.